Do you love the taste of delicious, fresh pickles? Are you growing cucumbers to make your own homemade pickles? 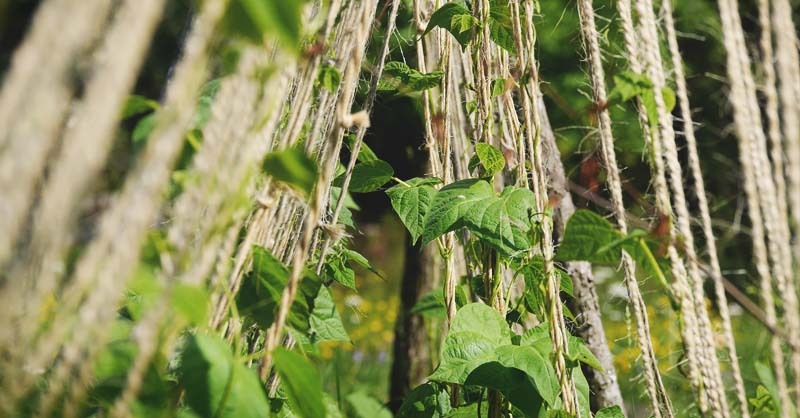 Well, if you’re growing cucumbers, you’ll soon realize how important having a trellis can be. A lattice will not only make picking a ton easier, but it’ll also help protect the fruit of your harvest. As cucumbers sit on the ground, they sometimes begin to rot. To avoid this predicament, it’s recommended to train cucumbers to grow up a trellis. 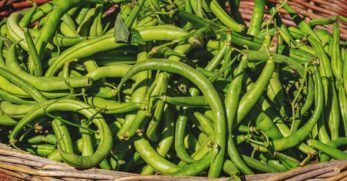 But what should a cucumber trellis look like? There are many options, and I’m going to bring you some of the internet’s best to put everything conveniently in one local place for you. This idea is simple, and I love it. 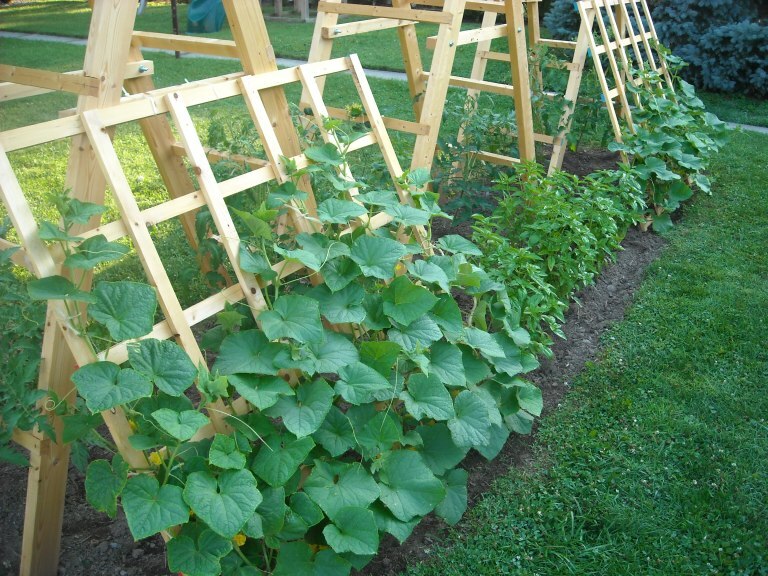 If you have an old wooden ladder you’re no longer using; you can repurpose it into a cucumber trellis. But the fun doesn’t stop there. 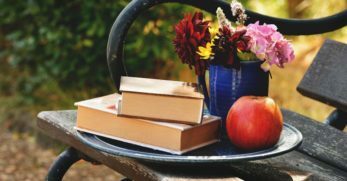 You can paint the ladder and use it to brighten up and add a touch of charm to your garden while it’s also busily holding up your cucumber plants. 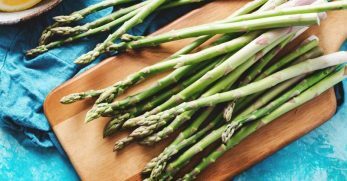 Are you working on a budget? Would you prefer a trellis which looked a little more natural while supporting your cucumbers? Well, this could be the one for you. It’s a stick ladder which is held together with hemp cord. You could use twine in its place. You hang it from the side of your home or a building, and it looks lovely and offers the support your cucumbers need. This structure takes more planning and some carpentry skills, but if you’re willing to put in the work, it will indeed do a great job. The tutorial makes this a great option even for beginner carpenters. 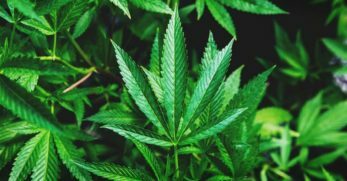 They give you a materials list, detailed steps to the process, and pictures to help too. 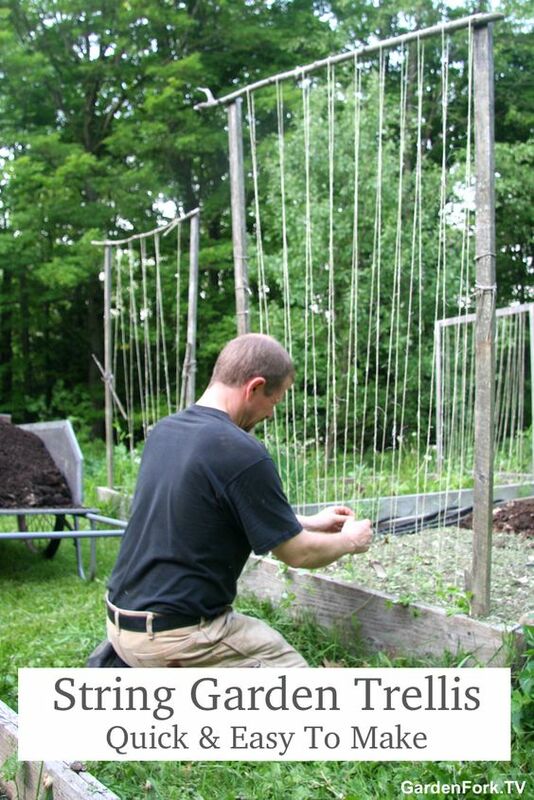 If you desire a handcrafted cucumber trellis, check this option out. 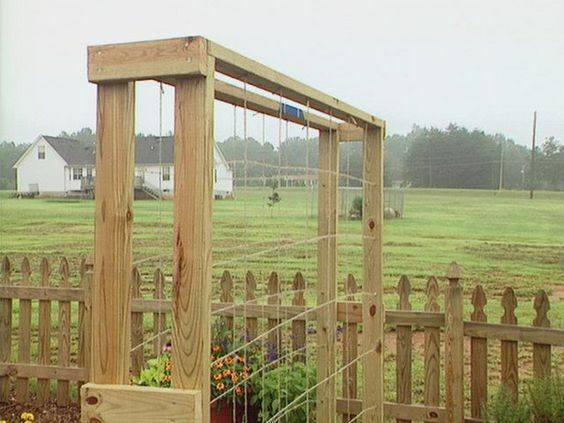 This trellis is another DIY option which requires some carpentry skills. The tutorial is detailed which makes it easier for those who are new to the carpentry scene. Either way, you’ll be walked through building the structure and how to wrap the plastic clothesline up the structure to support the cucumbers. It appears to be both a sturdy, budget-friendly and practical option. Chicken wire can be a sharp item to work with, but I love it. 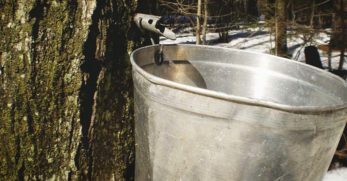 It’s sturdy, and if it can protect chickens, it can support your cucumbers. 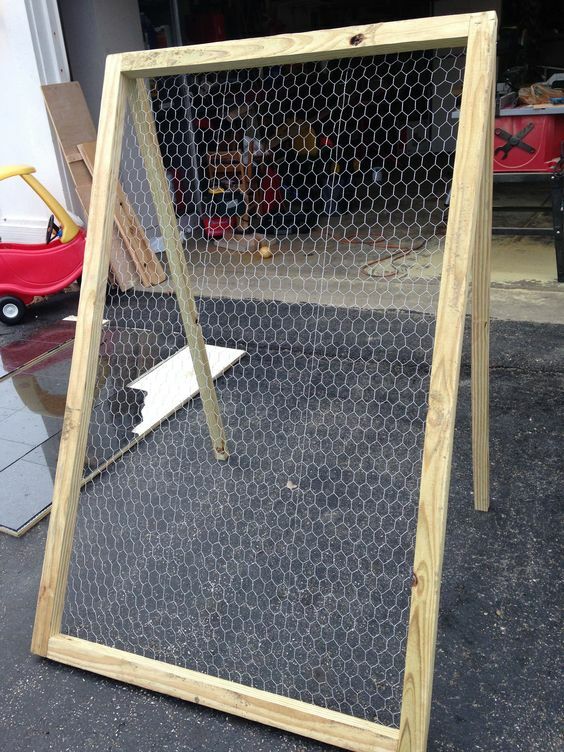 You build a freestanding frame; then you fill in the open space with chicken wire. 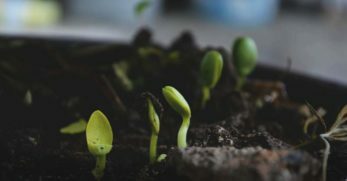 The cucumbers will grow through the wires and offer support while also helping your garden appear tidier. 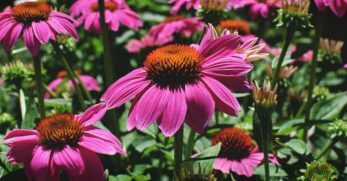 One of the first years my husband and I began to garden, we used the teepee method. You use larger sticks to form teepees. You use twine to tie the sticks together and support them. From there, you can wrap the string around the teepee and make it climb upward. 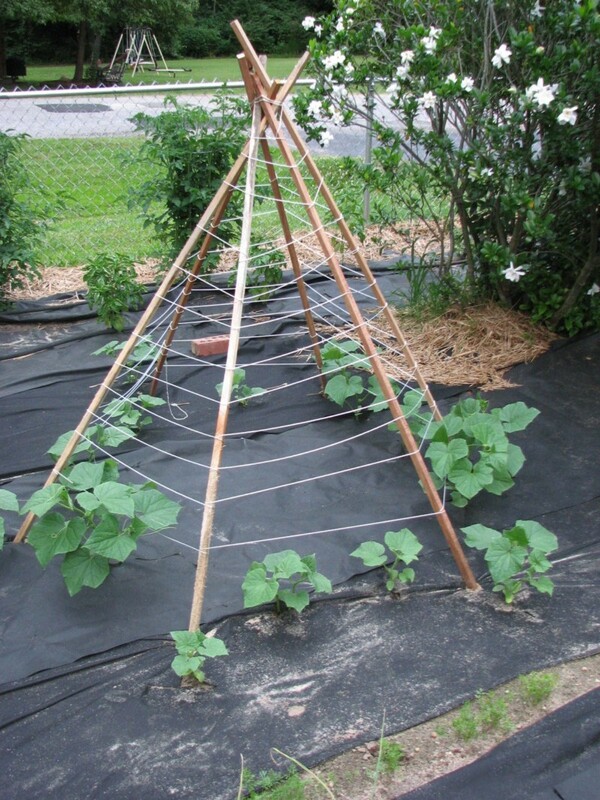 The cucumbers are planted at the base of the teepee, and the wire helps train the cucumbers to grow up the teepee. It makes for easier picking and a fun place for the kids to play too. 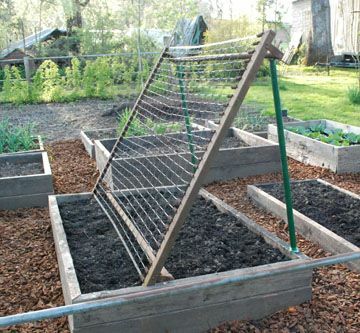 This trellis is a great idea if you’re growing your cucumbers in a raised bed. Though, it could still work if your cucumbers are being grown in rows in a traditional garden too. Either way, the trellis is a simple wooden frame with two horizontal supports. Once the structure is in place, you add wire fencing to serve as the support for the cucumbers to climb up. This trellis looks good and should work well too. 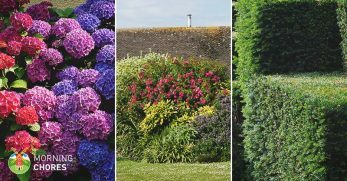 This trellis is both cost effective and functional. You can usually find pallets around town, especially at small businesses. Most of the time, they’re happy to give them away because you’re saving them money. When you find two pallets, you’ll make them into an A-frame design and bolt them together. From there, plant cucumbers on either side and allow the cucumbers to grow up the pallets. 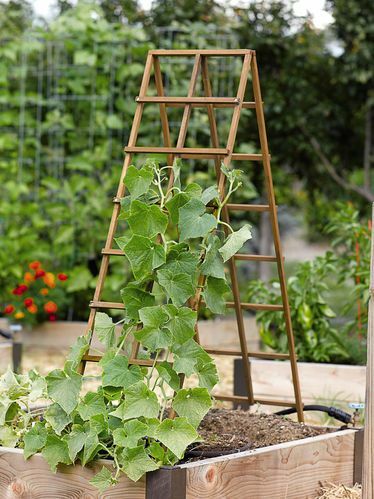 This trellis is another excellent option for cucumbers being grown in a traditional garden or a raised bed. You place the supports in the ground and create a square frame. Once the frame is in place, you create a wooden structure within the square which goes both vertically and horizontally. This gives the cucumbers a stable place to climb and find support. Are you looking for a simple way to support your cucumbers, but you’d like for it to look stylish as well? This simple design could be what you need. 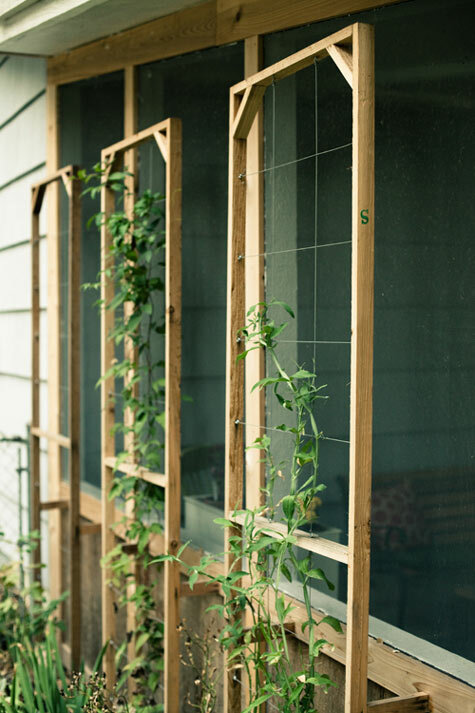 In this case, the trellis is built from cedar boards. After the frame is completed, a wire is used to create the grid pattern to support the cucumbers as they grow. 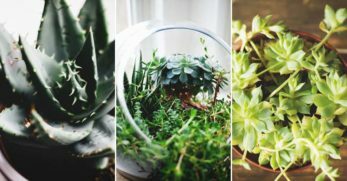 This idea is one which could be used for many different gardening techniques, but it will also require more space than some of the other ideas mentioned. You’ll build a structure from PVC pipes. 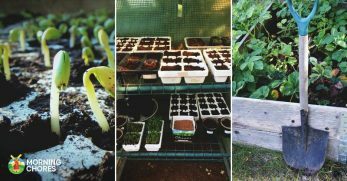 The cucumbers will grow up the pipes, but you can also add shelving to grow potted plants as well on the same structure. 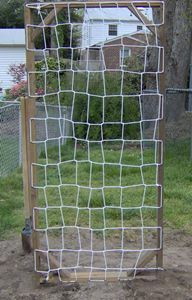 This trellis can be used to grow a variety of vegetables. 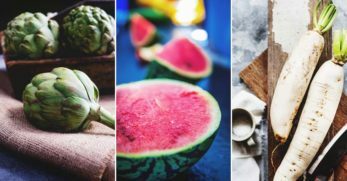 It would help support both cucumbers and squash. If you grow pumpkins, it could be used to support smaller varieties as well. If you’re in the market for a DIY, simple trellis which will also be multi-purpose, this A-frame design could be exactly what you’ve been searching for. 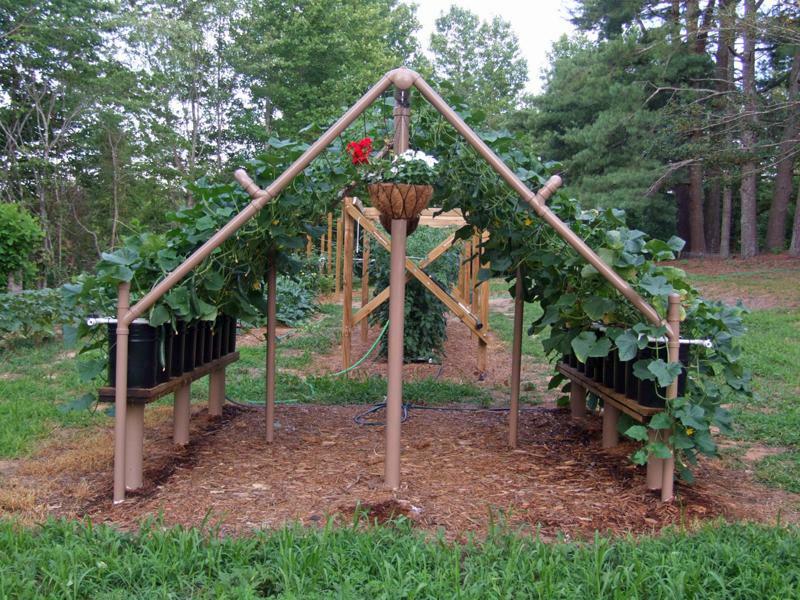 This is a lean-to design for a cucumber trellis. Many people prefer this design and refer to it as the perfect design. 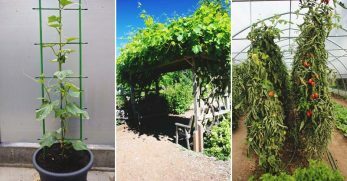 The main reason is this form of a lattice is easy to build, easy to put together or take down, and also offers a great deal of support to help you in growing healthy and productive cucumber plants. 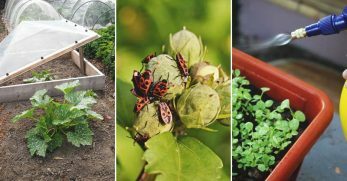 Are you gardening in raised beds and working with only a limited amount of space? 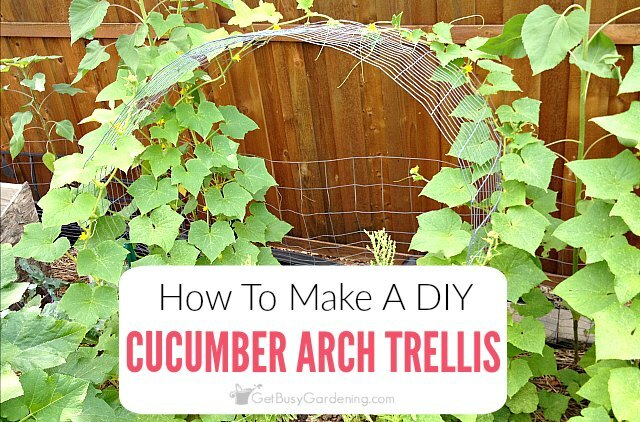 Do you feel like you need something different than the traditional cucumber trellis? Well, look this way. 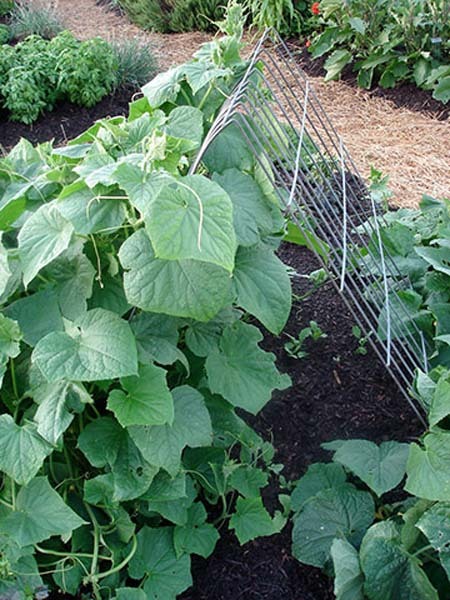 This cucumber arch trellis is made from a roll of wire fencing. It attaches to one raised bed and arches over to another. This takes up little space while also supporting your cucumber plants. Do you need a simple method for supporting your cucumbers? This idea could be what you’ve been searching for. 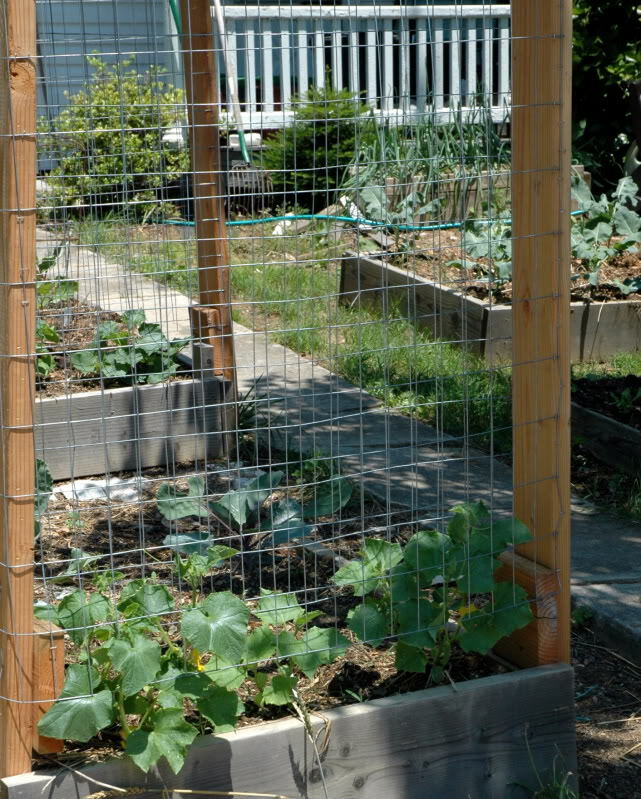 If you have raised beds, you can put a trellis at each end. You put two pieces of wood in the ground vertically and a beam at the top for support. You’ll run string vertically all the way across the wood frame. This is an inexpensive and straightforward way to trellis your cucumber plants. 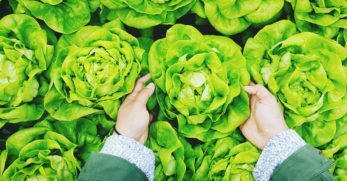 Do you grow a container garden? Don’t feel left out. This option should work perfectly for the gardener who grows their cucumbers in pots instead of in the ground. You create small teepees to place on top of the pot. The cucumber should be planted in the pot, and as it grows, it should grow up the trellis. 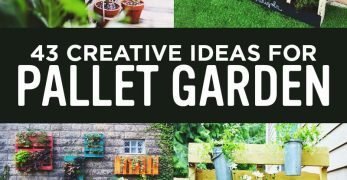 This is a neat idea if you’re considering adding raised beds to your garden. 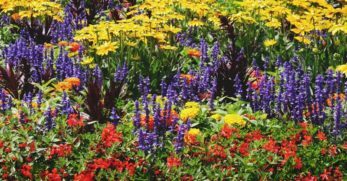 Instead of creating larger garden boxes, follow this idea. 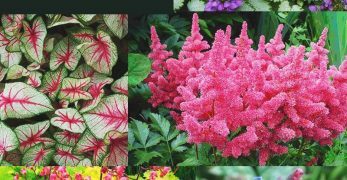 You’ll create two narrow garden boxes with space between them. From there, a wireframe will be arched and turned into a trellis between the two garden boxes. 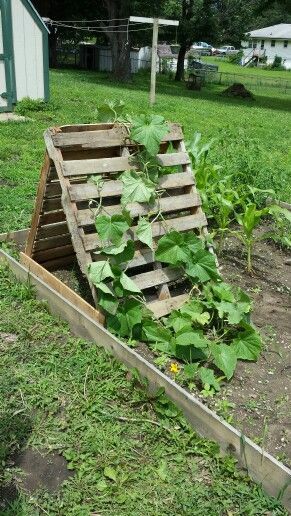 The idea is to plant your cucumbers in each box and allow them to climb the trellis while still giving you room to walk underneath it. 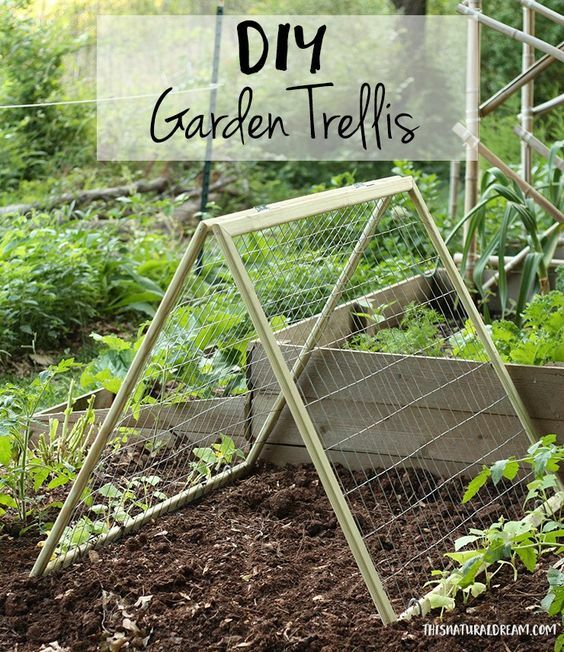 This trellis idea is one which looks classic but adds a little pizazz to your garden too. You build an A-frame design for the trellis. However, you create a wooden grid to fill in the open space of the frame. This gives the cucumbers room to climb. 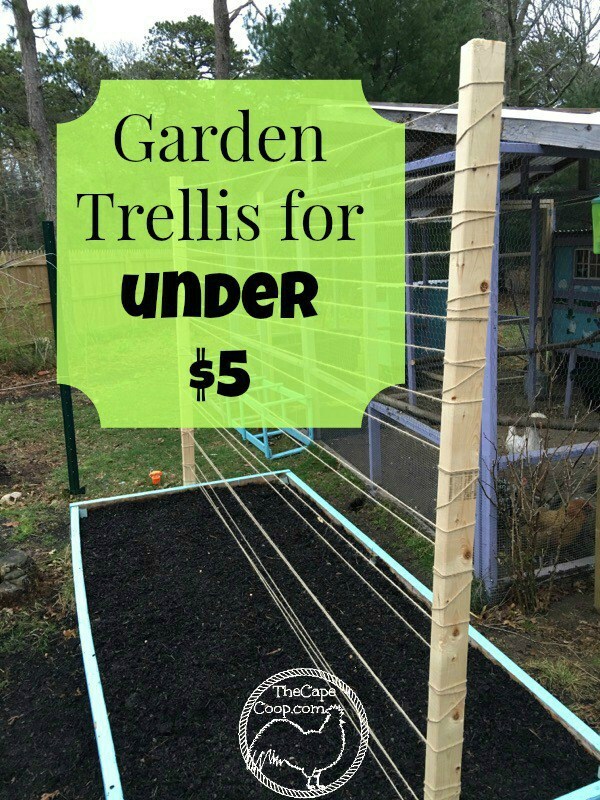 What sells this trellis more than other A-frames is how tall it is. It provides the gardener with room to maneuver beneath it. 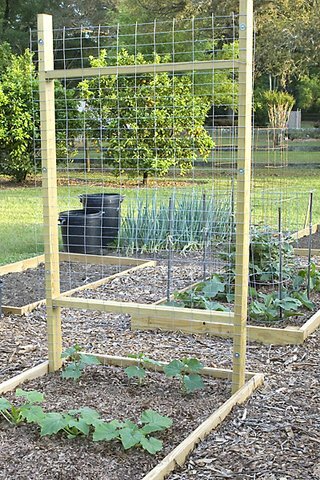 This garden trellis is another one which can be used for a variety of vegetables. It’s a good choice because of its simple design and low cost to create. You’ll place two pieces of wood at opposite sides and run twine between the two supports in a horizontal direction. This offers support to your cucumbers in a cost-effective manner. If you raise cattle, you may have leftover cattle panels hanging around. 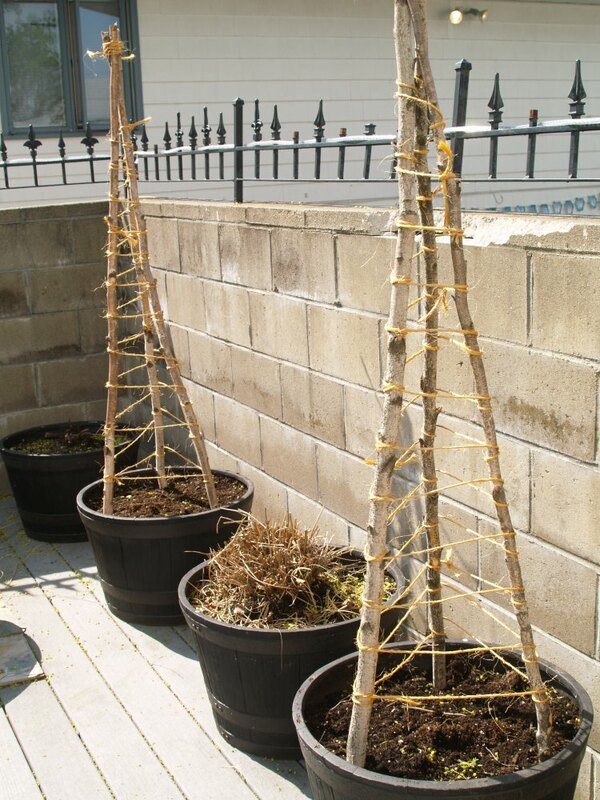 Put them to use with this idea for a cucumber trellis. 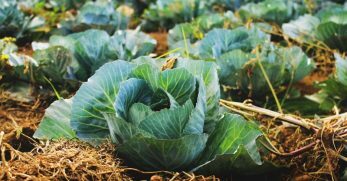 Cattle panels are a good choice for a cucumber trellis because they’re sturdy and taller which makes it easier for you to maneuver underneath while caring for your cucumber plants. Do you have leftover hog fencing you’d like to utilize but aren’t sure how? Well, don’t toss it. Instead, use it for your cucumbers. You can put two pieces of hog paneling together or bed one piece and form an A-frame design. Plant the cucumbers on either side, and they’ll climb the fencing for support. The cucumber trellis I use around my own garden is one we created with scraps we had hanging around our barn. We put step-in fence posts in the ground in front of our cucumber plants. 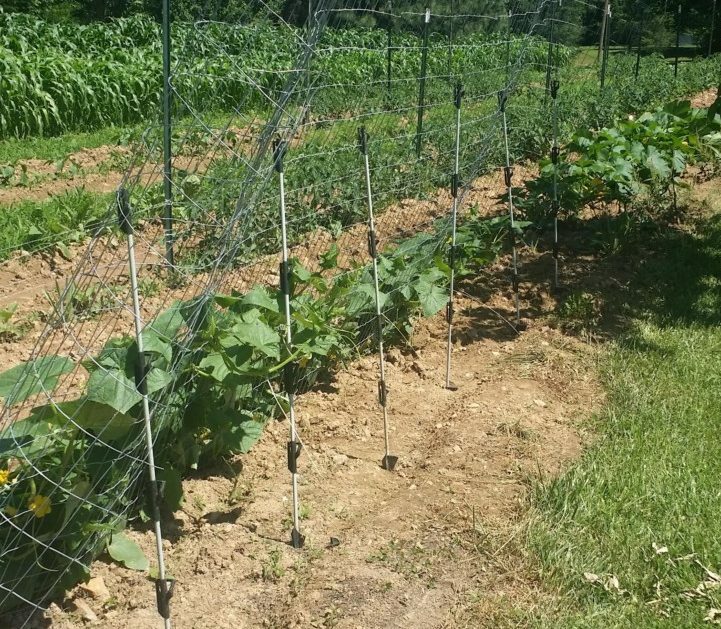 From there, we attached a piece of scrap fencing to the step-in posts and fed the cucumbers through the fencing. It has worked well and cost us nothing to create. 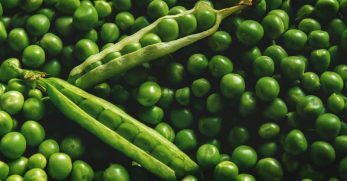 When you think of growing a vegetable in a cage, cucumbers probably don’t come to mind. After this, you might change your mind. If you grow your cucumbers in raised beds, consider putting a fence around the bed. The cucumbers will be protected from animals which like to eat them and also have a fence to grow up. Well, you now have 23 different options for creating a trellis for your cucumbers. Some are more involved while others are cost-effective and simple design ideas. Hopefully, you’ll find something to do the job while keeping within the budget and comfort level of your carpentry skills.